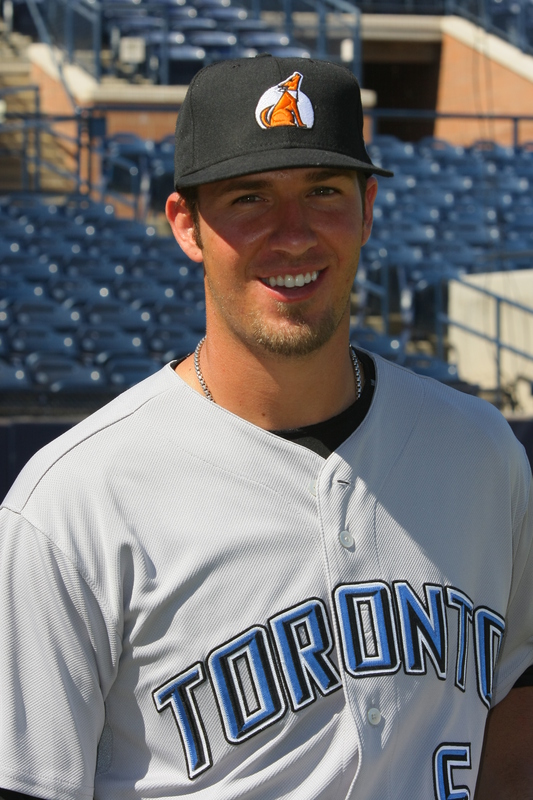 Hi, my name is J.P. Arencibia, and I am a catcher in the Blue Jays organization. This year I played my first full season in High A, got moved during the All-Star Break to Double-A, and I finished up the season in Double-A. I learned a lot this season, especially how long the season is and so did my legs. My organization sent me here to work on some things in my game. Obviously all aspects you try to improve, but mostly to see more pitches. It’s been an honor to play with such talent in the league, but what impresses me the most is the quality of guys in this league, on a personal level. This is my second time to the AFL. The first time I came as a fan when I was a junior in college. Chase Headley and Luke Hochevar were my college teammates and I came here to watch them play. We have the best fan in the AFL, and her name is Susan. She makes my day every time I come out of the dugout. She has the most positive attitude I have ever been around. I also get to experience the Arizona Diamondbacks flag lady, who is also one of my favorites. I’m kinda upset I haven’t been able to play golf yet because I heard the golf courses are great out here. I did get to attend a Cardinals football game which I enjoyed, and hopefully I will get to see a Suns game and see Shaq–which you guys stole from Miami! I am staying with Travis Snider, who also plays in the Blue Jays organization. On Sundays we have BBQs at the house and play Rock Band. Thanks for reading my blog, and don’t be scared to say ‘hi’ to me at the ballpark! We are left with two weeks left in the AFL and my Desert Dogs are in first place, looking at a championship birth. �Hopefully this means we can when the whole thing and get that ring. �I have never been on a championship team. �I came close once with my teammate Tony Barnette �on the Central Arizona College�Vaqueros. �We got destroyed to say the least at the Super Regionals on step away from the NJCAA World Series. �I have never been that close ever since. �Let me tell you if there is one thing I would like to do in baseball, thats win a ring. Everything is going great otherwise, it been fun and a new experience. �Still, I cant wait to go back to New Zealand for Summer and of course Christmas on the beach!!! Till next time, keep on keeping on. 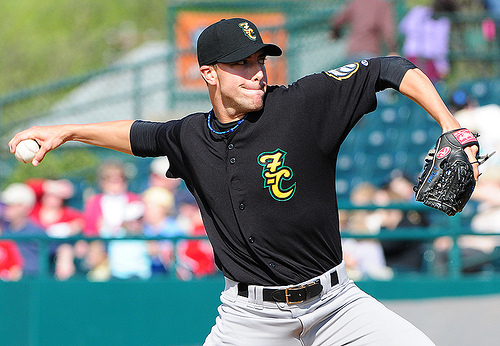 Hey everyone this is Zach Dials with the Toronto Blue Jays. Coming here i had no idea what to expect, i didn’t know how all of my teammates would act, how the league works, or where i would live. So far all of my teammates have been great, after the first couple days, we opened up rather quickly and many of these guys are becoming good friends of mine. The AFL is by far the most exciting and challenging baseball I’ve ever participated in. So things ended up turning quite well and i don’t have a complaint in the world . As for my living conditions I couldn’t be much happier, my house is amazing and I’m rooming with three of my teammates from the Jays(Darryl Harang, Scott Campbell, and Mike MacDonald). I honestly can’t believe how quickly time goes by when you are playing ball. It seems like just the other day my teammates and I were all starting spring training and now the regular season is over and the AFL is already half way through. As I look back at this season and evealuate myself I am proud of what I have accomplished for myself, my family, and all my friends back home. I realized that I took quite a few large steps as far as my career is concerned. Making it to Double-A and then being asked by the Blue Jays to represent them in the AFL which is quite an honor and I am appreciative of everything the Jays have done for me. They are a great organization to play for and I can truly say that they honestly care about you and they will work along side you as hard as you want to work. That being said I know there is much more i must do to improve my skills so that i can reach the major leagues and help the Jays as much as I possibly can. My season is starting to come to a close and home is just around the corner. I always hate the end of the season but I am looking forward to seeing my family(Jerry, Dawn, Jake, and Josh). Another exciting thing about this off season is that I’m making quite a large move going from good ole’ Wabash, Indiana to Houston, Texas where my girlfriend Alison and her family are waiting for me. I wish I had more time to see all of my family and friends and sometimes it’s hard but dreams are often long hard roads with much sacrifice, but as close as I am now I wouldn’t even consider looking back. I hope everyone who reads this blog enjoyed it and try to give me a break if you could, it was my first one. Take care and Root for those RAYS! What a week. �I love it here in this beautiful town, with weather so great all the time. �I had a chance to really take it all in this week, and I would really consider moving here. Baseball is going well. �I still feel a little off balance at the plate due to the lack of ab’s, but my swing is still their when I need it. �To answer a question someone asked me about baseball in New Zealand, we got around two games a week on TV Sunday night and Wednesday night baseball. �With the time change that was lunchtime Monday and Thursday…. lets just say that I missed a little bit of school growing up to watch baseball!!! My dad dropped by on business so it was nice to see him even though it was only for two nights, but any time spent with him is good due to both of our crazy travel and schedules. �I can believe that we have been here 25 days already it has really flown right by. �Its less than a one to go now so I better make the most of it all. As I say Take her easy, and catch you next week!